Motor insurance or Car insurance is one of the most beneficial type of General Insurance. It is governed by the Motor Vehicle Act, 1988 and covers all motorized vehicles on the road. Broadly speaking, there are two types of Car Insurance policies – Third Party and Comprehensive. Let us quickly compare the two on a range of key factors. Let us suppose you are driving your car and you happen to ram into a motorcyclist on the road. As its name suggests, a third-party insurance policy will provide coverage to the other person and/or his vehicle (the motorcycle and its rider in this case). The insurance company will bear the cost of his/her medical bills as well as the repair costs for his/her motorcycle. However, it will not provide any coverage to you; you will have to foot your own bills, be it any amount. On the other hand, a Comprehensive insurance policy offers coverage to both, a third-party as well as you – the insured. So, in the above instance, in addition to the motorcyclist, a Comprehensive policy would cover damages to your vehicle and the cost of medical bills against injuries caused to you. 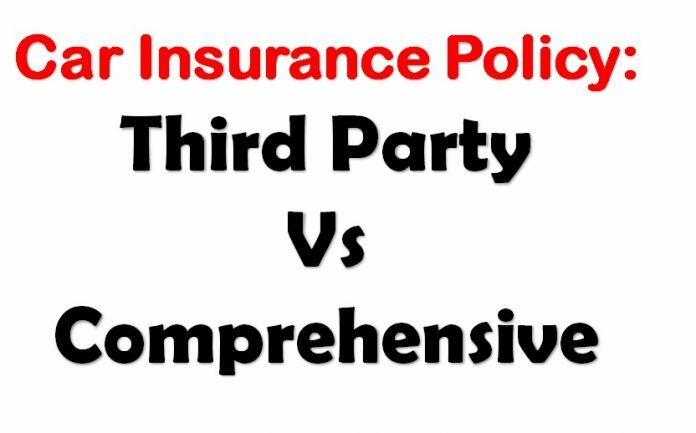 To sum it up, a Comprehensive policy provides a much wider coverage than a Third-party insurance policy. Ever wondered what happens if your vehicle gets damaged by a natural calamity or worst, if it gets stolen? You will not get any compensation whatsoever if you only have a Third-party coverage. However, a Comprehensive policy covers such unfortunate incidents. It also provides coverage against other ill-fated incidents such as fire, floods, vandalism etc. As we have understood earlier in this article, a Comprehensive policy offers much wider coverage. Accordingly, it commands a higher premium as compared to a Third-party insurance policy. As per the Motor Vehicles Act, 1988, in India, it is not legally necessary to have a Comprehensive insurance policy. However, you are legally not allowed to drive your car without the basic cover of a Third-party insurance policy. A Third-party insurance policy does not provide for many add-on covers. However, a Comprehensive insurance policy offers several add-ons such as zero-depreciation cover, accessories cover, roadside assistance cover etc. at a nominal cost. To conclude, only if you have budget constraints, consider going for a Third-party insurance policy. Under all other circumstances, it is always a wise decision to opt for a Comprehensive policy as is provides complete peace of mind.